From Dancing with the Stars runner-up and Duck Dynasty star Sadie Robertson comes a fun novel about two teenage girls from different backgrounds and opposite lifestyles who discover there is more to friendship than what meets the eye. Sixteen-year-old A.J. Stewart, born and raised in backwoods Tennessee, loves nothing more than repairing broken cars with her father and hanging out with her brothers and their friends. Not far away in the busy city of Nashville, Kate Kelly is always dressed in the latest fashion, wearing clothes from her mother’s boutique and jetting around the world with her father. When A.J. starts going to the school Kate attends, they instantly dislike each other. But as the year progresses, Kate’s brother Val is drawn to A.J., and when prom comes around, he asks her to be his date—much to his sister’s displeasure. The following summer at camp, the two girls continue their dislike of each other, until a surprising moment of openness when A.J. shares her faith with Kate. As their bond grows, they discover that they share an inner resolve to live life as God intended, and to live it in their own individual and original ways. 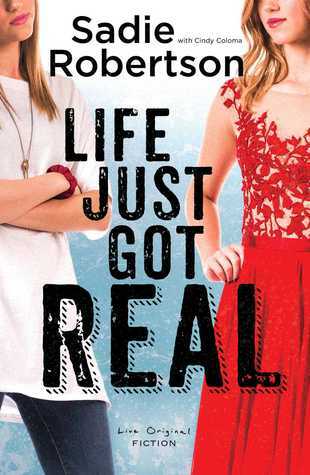 Life Just Got Real is Live Orginal Fiction by Sadie Robertson that has a romantic side; that is light, but deals with stuff that teenagers go through. Sadie isn't afraid to touch things like gossip, jealousy, insecurity, or trying to take a fiction story and write in such a way that the characters have to look to Christ as the main focus. I love that Sadie is brave enough to write a book about the stuff that male and female teenagers face today in a real way through fiction. She also uses this book to show how those who are different from one another can be friends and come together. I think this is a great novel, and I would love to see more from Sadie with these characters. I hope to see more from her in this series. The message is powerful for young tweens and teenagers. I give this book five stars, and I highly recommend it. Thank you, Wynn Wynn Media for provided me a complimentary copy for my honest review.